This generation II Subaru Impreza can put a sizeable slice of its sales success down to its tremendous success on rally stages. Gloriously left-field (and in the hands of many an inexperienced rally driver, in a field) this generation II Subaru Impreza can put a sizeable slice of its sales success down to its tremendous success on rally stages. Be it STI, WRX or simply Impreza, those bobble-hatted fans of rallying embraced Subaru’s wild-child with a fervour that was the envy of all the Japanese firm's rivals. That 'race on Sunday, sell on Monday' worked, too, meaning there are quite a few used examples around. Introduced in 2000, this second generation Impreza followed the successful formula of its predecessor to the letter. Slightly smaller than full-sized family cars like Toyota’s Avensis or Ford’s Mondeo, the Impreza actually offers similar space to a Corolla/Auris or a Focus. It’s a saloon too, or if you want a pseudo-estate, a ‘Sport Wagon’, which adds a hatchback and a little more practicality. Like all Subarus it’s pretty workmanlike inside, the plastics akin to what you’d have if you melted the contents of your recycling bin, though for all their shininess and general lack of tactility the Subaru’s interior, like its mechanicals, are very robust. The exterior styling is either mundane or extrovert, depending on whether you’re after a non-turbo bread-and-butter run-around, or a rally-aping WRX and STI model. Thankfully the bug-eyed headlights of the car in 2000 were hastily replaced by more conventional lamps from 2002 onwards. The engine line-up consists of a range of flat-four ‘boxer’ engines, and this unusual configuration is part of the reason it excelled as a rally car, though not admittedly with the lowly 1.5-litre naturally aspirated engine. For performance you need the 2.0-litre turbo, or 2.5-litre turbo, both combined to Subaru’s four-wheel drive system, giving it remarkable pace, allied with surefooted handling. A further facelift in 2005 is recognisable by the three-part front grille and sharper headlamp design. Automatic gearboxes are available on the naturally aspirated cars, but the turbocharged performance models only came with manual transmissions. Watch out for tuned examples, the turbocharged models easily producing more than their stated horsepower. Numerous specials were produced, the myriad of WRX and STI options impossible to cover here. If you’re in the market it’s likely you’ll know what you’re after or take some time to do the research via specialised forums and owners’ clubs. 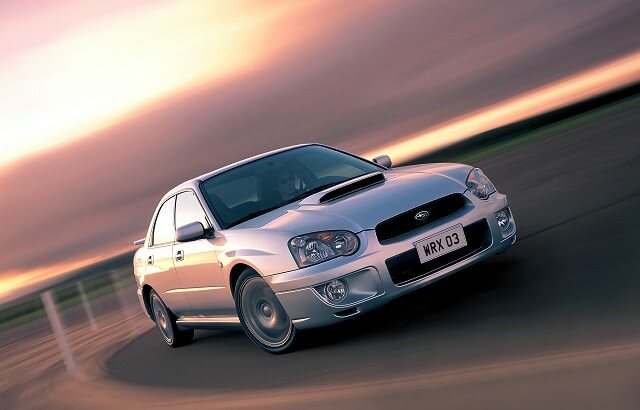 It won’t be cheap to fuel, but there’s no denying the appeal of a late WRX model with its turbocharged 2.5-litre engine, four-wheel drive and plentiful performance. Even the earliest cars will excite with their ability, keeping more modern performance machinery honest. There’s a decent selection, though do spend a bit of time checking out the car’s history. The saloon looks best to our eyes, but if you need a touch more practicality then the estate version is worth consideration. Not an obvious choice given the breadth of useful family cars out there to buy, but if you want a lot of performance, huge grip and mighty cross-country pace wrapped in a relatively plain body then the Impreza is hard to beat. It’s built to last, too, though you’ll get familiar with fuel stations.